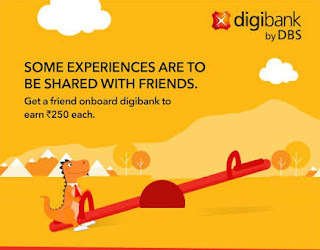 DigiBank by DBS Ola offer – Get Rs 250 Cashback on Signup for Savings accounts. DigiBank has come up with an awesome deal where you have to Sign up for a Savings account and Get Rs 250 Cashback in your wallet account. Also Get Free Physical Visa Debit card (International enabled). This Offer is valid for Selected Cities. So Hurry up and avail this Offer now !! 3) Valid for Selected Cities – Bangalore, Chennai, Cuddalore, Delhi, Kolhapur, Kolkata, Moradabad 🙂 , Mumbai, Nasik, Pune, Salem, Surat. DBS Service are available in these Cities only. 2) Get Rs 500 Free when you do transaction of Rs 5000 using your DigiBank Debit card. 3) You will get Free Physical debit card which is also international enabled. 5) Free Fund Transfer, Free Adding via Netbanking/Debit card. 7) Earn Rs 200 per Referral. 1) Download the digibank by DBS app from Google Playstore or Apple App Store. 2) Register with promo code ‘CLEAR250 or OLADBS’ and key in your basic details for digibank e-Wallet. (Important to Receive Rs 250). 3) Open an instant digiSavings account by keying in your PAN and Aadhaar number. 4) Complete your Aadhaar authentication as per options available in the digibank app. 11) By availing the Offer, you are deemed to have read, understood and accepted the above mentioned Terms and Conditions.